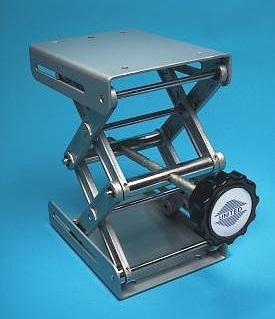 A selection of scissor type laboratory jacks including robust, heavy duty and stable all stainless steel jacks that can support up to 75 kg and lift up 270 mm in height. 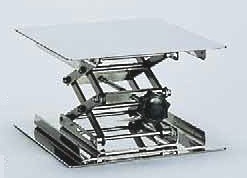 1000294 Laboratory Jack LAB-ELE with anodized aluminum base, top plate 120 × 140 mm, maximum elevated height 260 mm, maximum support weight 7 kg. 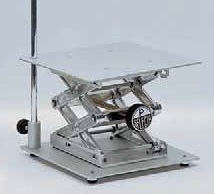 7000295 Laboratory Jack LAB-ELE with anodized aluminum base, top plate 200 × 200 mm, maximum elevated height 260 mm, maximum support weight 12 kg, with hole and clamp screw for a support rod of 10 Ø × 600 mm. 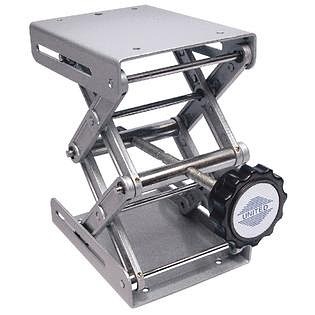 1001104 Laboratory Jack LAB STEEL MINI completely made of AISI 304 stainless steel, heavy robust construction with stable body, top plate 100 × 100 mm, elevated height range 55 to 155 mm, maximum support weight 45 kg. 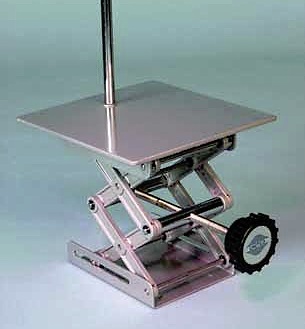 1001105 Laboratory Jack LAB STEEL MAXI completely made of AISI 304 stainless steel, heavy robust construction with stable body, top plate 250 × 250 mm, elevated height range 65 to 270 mm, maximum support weight 75 kg.